The Church of All Saints is situated in grounds to the south of Babworth Hall. It lies on a pleasant bank surrounded by trees, at the end of what used to be the main road from Worksop to Retford. The church is described in White's Directory of 1853 as "a neat, Gothic edifice, with a tower and three bells, and contains several marble monuments of a modern date". It was built in the Gothic Perpendicular style and has embattled tower, nave, chancel and aisle. 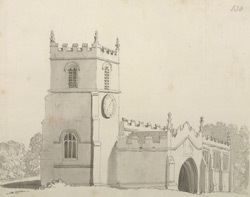 Babworth Parish church served a scattered parish, including the Nottinghamshire hamlets of Babworth, Morton, Ranby.